The nominations for the Audio and Radio Industry Awards have been unveiled by Capital South Wales Breakfast presenters, Matt Lissack and Polly James, live at the Next Radio conference in London. They are dominated by the BBC with 58 nominations, followed by Bauer with 30, Wireless with 13 and Communicorp with four. The rest is made up of Prison Radio (3) Celador (1), UKRD (1) JACK (2), BFBS (1), Q Radio (1), community radio, independent producers, individuals and podcasts. Noticeable non-contenders once again this year include Global, owners of half of the commercial radio industry, Nation Broadcasting and Lincs FM Group. The awards, organised by The Radio Academy and supported by LeedsBID (Leeds Business Improvement District), recognise talent, innovation and excellence across the audio and radio industry. New categories this year include ‘Best Local Radio Show’, ‘Funniest Show’; ‘Best Commercial Promotion’ and ‘Best Station Sound’. Each category has nominations a shortlist of six, with a Bronze, Silver and Gold winner to be announced at a ceremony on Thursday October 18th at the First Direct Arena in Leeds, hosted by KISS presenters, Melvin and Pandora. 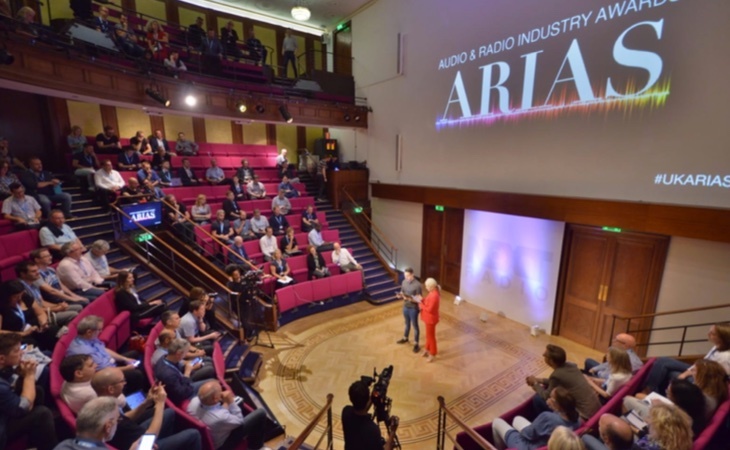 ARIAS Chair of Judges, Phil Riley commented: “Year three of the ARIAS and the standard feels even higher, with industry veterans vying with new and upcoming talent in nearly every category. It’s great to see the BBC, commercial, indies, community stations and podcasters all doing so well. “Eye catching nominees include ‘You, me and the Big C’ in best new show and the rivalry, once again between Chris Evans and Sam & Amy in best music breakfast. Tickets to attend the ARIAS, together with the exclusive after-show party and welcome drinks reception, will be free to all Radio Academy members and are now available to book from the Radio Academy website.